Prior to relocating to Southern California, chef Joe Sasto dove head first into the restaurant industry by training under some of the Bay Area’s most acclaimed chefs and restaurateurs. Although culinary school was not in the cards, he fostered his early interest in cooking by working in kitchens while attending University of California, Davis. Driven by his childhood experiences cooking alongside his mother, he made his own way after earning his Bachelor’s degree, and in 2010 he helped to open a restaurant as a line cook in Ukiah, earning a swift education in the business and cementing his passion for the restaurant world. Sasto moved to San Francisco and gained tutelage under chef Jason Berthold at RN74, where he really started to find his footing. Quickly rising through the ranks from line cook to sous chef in a short six months, Sasto went on to work under executive chef Adam Sobel, with whom he launched a winning streak at Cochon 555 competitions, culminating in the top prize at Aspen’s Food & Wine Classic in June of 2013. Following a break to travel through Europe, Sasto returned newly inspired and began working with acclaimed chef Michael Tusk. He started at rustic Italian restaurant Cotogna, before spending three years at neighboring sister-restaurant and three-Michelin-starred Quince. Under Tusk, Sasto was entrusted with the handmade pasta program at Quince, learning the ropes and roots from one of America’s most celebrated Italian-influenced chefs. Of equal impact, Sasto simultaneously managed the market program, meeting with local farmers and purveyors at weekly farmers’ markets in San Francisco and Marin County to source pristine ingredients that would inspire that week’s menu in the restaurant. 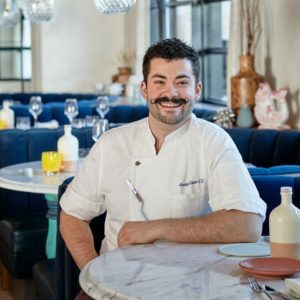 Sasto serves as executive chef at Michael Mina and Adam Sobel’s new restaurant, Cal Mare, which celebrates authentic coastal Italian cuisine while featuring California’s bountiful ingredients.